CALAN received a standing ovation on NPR's "Mountain Stage"
Un-traditional traditional Welsh band CALAN pulled a standing ovation at their inaugural appearance on NPR’s Mountain Stage Radio Show . Listen to the performance below. When Calan, the Wales-based Gwerin (translation: Folk) group came to the U.S. in September, the first stop the band made was at the Daytrotter studio in Iowa. The band's high-energy performance is now archived at Paste. Watch it here: http://bit.ly/CALAN-PASTE. Calan has arrived in the US! First stop: Daytrotter's studio in Davenport, IA! “Composed of a new generation of ambassadors, striving to take their sound to new audiences, raising some eyebrows with their deliberate presentation.” - Blurt with the premiere of the latest video from the Welsh (un)traditional folk five-piece, Calan. New album Solomon out today, the band tours North America this fall! 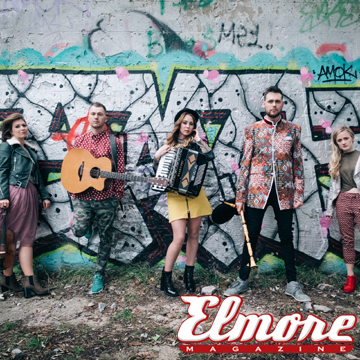 Calan is the rule-breaking Gwerin (read: traditional Folk) group from Wales that has moved Elmore Magazine to break rules of its own to cover them. "Kân" is the lead track from the band's new album Solomon, out this Friday, and features a sampled reading from famed late poet, Nigel Jenkins, he late father of Calan's fiddle player, Anghara. "A fantasy of fiddling and harp, a downright theatrical piece of traditionally stylized folk music." Well said, MAGNET! Calan arrives in North America later this year in support of the upcoming new album Solomon, out May 12th. Hear "Apparition" now.